On Friday 5 and Saturday 6 April, the Wired4Music team and four network members who were employed as curators delivered a trio of Wired4Music presents events as part of the London City Takeover. 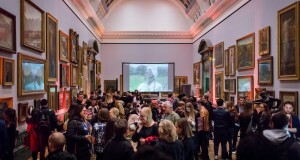 We were super excited to produce a number of events for the Late at Tate Britain series. On Saturday we also saw an amazing group of people working across radio, music journalism and live events come together for an intimate panel chat which saw 20+ Wired4Music members turn up at 9am on a Saturday morning at a top secret location! The weekend included the brilliant Gnarly, who led a workshop demonstration on finger drumming on her electronic drum pads to a packed out room at Tate Britain. A really special installation, curated by Sherwyn, took place in the grandiose and very busy 1840s room at Tate Britain. And on the Saturday panel, Shay Sade, Errol Anderson and Amahla spoke with Wired4Music member Lauren Arch who lead the conversation, with questions from audience, before, during and after the event. A dynamic and inspiring weekend, and definitely one to remember.